Pioneer BDP35 BLACK Spiral Bound Album, 4x6-300 Photos #BDP35/BK Le Memo. Condition is New. Shipped with USPS Media Mail. Paris Eiffel Tower Photo Album. Holds 300 4X6 Photos. Lovely Gift or Keepsake. Holds 300 4X6 photos. Lovely gift for that Paris Lover in your life. Add a touch of Charm to your picture taking. Beautiful way to display and preserve those special pictures. The Library Collection 300 Pockets 4"×6" Photo Album **NEW**sealed in plastic. The outer album is 13.5"×9" . Might have some minor wear from storage for a few years. Shipped with USPS Priority Mail. 3-up album initially holds 300 photos up to 4"x6". This photo album features a leatherette cover with gold stamping. It initially. Clear pockets with a White paper background. displayed three per page. KVD Fiori photo album. Holds 300 4"x6" photos. Archival quality, acid and PVC free. 3-up album holds 300 photos up to 4"x6". Patented Bi-Directional pockets hold horizontal or vertical photos. Archival, photo safe: acid, lignin and PVC free. The album is bookstyle bound in a black sewn leatherette cover. Photos are displayed three per page. Sewn leatherette cover. Archival, photo safe: acid, lignin and PVC free. Model - DA-300COL. GREAT SERVICE. This elegant leatherette cover photo album features antique gold tooled accents and a rounded spine with color coordinated "PHOTO ALBUM" emblem. The album's patented Bi-Directional pockets hold horizontal or vertical photos up to 4"x6", plus panoramics. Photos are displayed three per page. Photo safe: Acid, lignin and PVC free.Make sure this fits by entering your model number. Holds 300 photos up to 4"x6". We stand behind our products. Photo Safe: Acid, lignin and PVC free. Brand new graphic geometric design photo album. Holds up to 300 4x6 photos. Smoke free pet free home. Windsor Browne Mini Photo Album 3 pack - holds 300 4” x 6” Photos. Condition is New. Shipped with USPS Priority Mail. Trending at $19.84eBay determines this price through a machine learned model of the product's sale prices within the last 90 days. LeVie PHOTO ALBUM BOOK BOUND BINDER Holds300 photos 3.5 X 5 or 4 x6 photos Black. Condition is New. Suede, Shipped with USPS Priority Mail. 300 slip-in Pockets. Holds up to 4" x 6" photos. Optically Clear Pockets Securely Protect Photos. Archival, Photo Safe: Acid, Lignin and PVC Free. Mini Max Pioneer 4 x 6 Slip-in Photo Album. 3 album set, 300 pockets total. Vintage bonded leather 3 ring binder photo album with double sided 50 slip in photo sheets to hold a total of 300 pictures. It is in fair condition. It’s a little rough around the edges (dings and scratches) as noted in the pics but the slip in photo sheets are flawless, the three ring binder is solid and the overall album is very well made and sturdy. The measurements are 13x8x4. I believe it was made in the 70s. It is unbranded. Thanks for looking at my post and have a great day! Br an d ne w album Th e plastici s brokeni n on e spoto n ba ck but al bu m is n ot d am ag ed P le as e no te p ic s.
Make sure to not throw anything away before you know the item arrived in good condition! However, we are only human and a problem can always arise. We will always fix whatever problem might occur. 3 Ring Photo Album 300 Pockets Hold 4x6 Photos Teal. This photo album features a leatherette cover with gold stamping. The 3-ring binding accepts refills (style no. photos are displayed three per page. ). Open pocket micro static bi-directional photo album. the color is gray. YOU ARE BUYING SET OF TWO ALBUMS. Trending at $13.58eBay determines this price through a machine learned model of the product's sale prices within the last 90 days. New Uniek 300 Pocket Photo Album. 3 Ring Binder Style. Holds 4 x 6" or 3.5 x 5" Photos. The leatherette album has a modern look, milky white color. Pocket sleeves are clear, photo safe, acid and PVC-free. Perishable products like food have over 1 year shelf life. Add To Favourite. Model - V1-N55074-3 W.
Three Photo Albums Holds 300 Photos Up To 4 By 6. Condition is New. New pioneer photo album in a beautiful color blue with gold trim. The album holds up to 300 slip in 4x6s. Thanks for looking at my post and have a great day! 300 Pockets. 300 slip in clear plastic pockets. PHOTO ALBUM. Photo safe - Acid and PVC Emidion Free. P I O N E E RDELUXE COVER. Durable, washable leatherette cover. WORLD TRAVELER. Still in box case. Never used no creases or writings. Brown Leather back front and side. 200 slits. Pioneer High Capacity 2-Up Photo Album 8"X8" 300 Pockets-Brown & Beige. 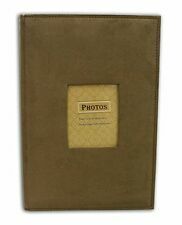 The album is bookstyle bound in beige fabric with brown sewn leatherette trim. Photos are displayed two per page. Optically clear pockets. Holds 300 photos up to 4"x6". Photo Safe: Acid, lignin and PVC free. Total 50 pages for this photo album. This album can hold up to 300 4"x 6" pictures. Each page can display 3 photos. Model: N55010-2 Brown. Two beautiful Pioneer photo albums with cd holder. Genuine Leather a Black Photo Album. 2 Pack each album holds 300 photos each. Side loading pockets holds 3x5” 4x12” clear pocket will hold Personal Event Book ark or Panoramic Print. Perfect for digital prints. Pictures tell 100 words please look at them for no disappointments. This same set is selling on amazon for $149 Thanks for looking. Brand new! ! 300 pockets! ! !